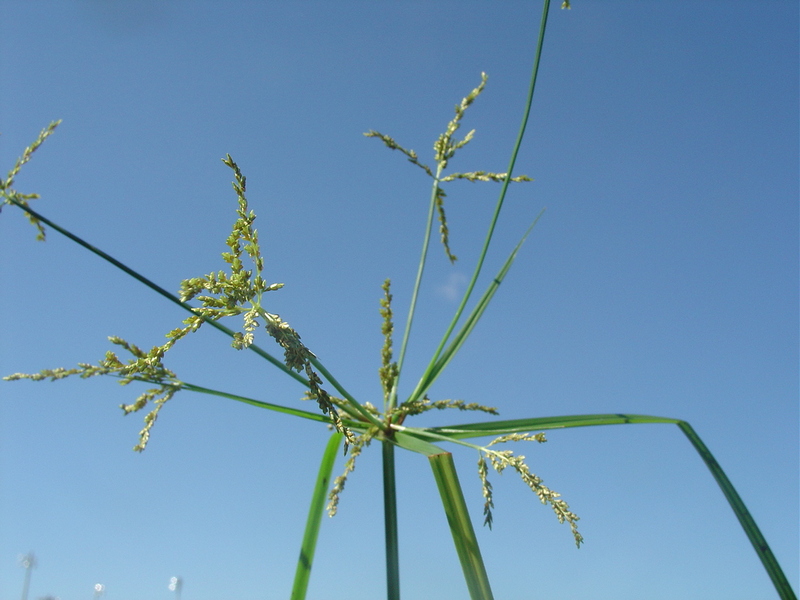 Cyperus iria is an annual C4 sedge (Li et al. 1999), to 60 cm, tufted, bright green, base often reddish, fibrous rooted, stems 3-sided, smooth. Leaves mostly basal, usually shorter than flowering stem, sheaths pale, rather membranous; inflorescence bracts long, leaf-like. Flower spikelets flat, to 1 cm, 10-20 flowered, ascending and at varying angles to stem of spike, flower scales broadly egg-shaped, overlapping, giving spikelets a finely crenate or braided appearance, achenes 3-sided, about 0.1 cm, brown, becoming blackish; inflorescence green-brown, spikes on stalks of varying length (rays), branched at top, spikes, loose, 1-2 cm, open; blooms and fruits July-Oct.
Habitat: Open, wet areas, emergent marshes, roadsides, curbs.